Started by Shoryl of Tiny WoW Guild, Mog Busting is the latest transmogrification challenge to sweep through the blogosphere. As I flicked through the various requests and results, I was secretly hoping someone would tag me and low and behold, tagged I was, by Effy of Effraeti’s RP. Some Background and Requests – Feel free to show some skin! 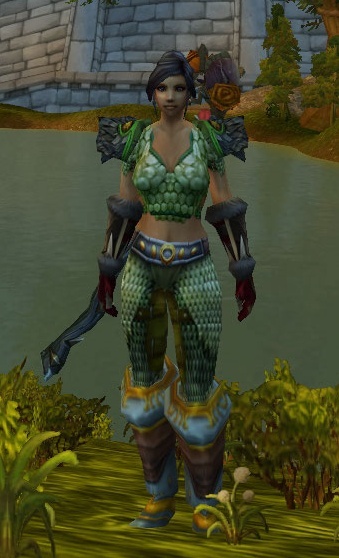 I am fond of the Imbued Plate Armor chestpiece on her, but this is by no means a requirement. What is far more important with Effræti is her Runeblade! Either the sword or axe DK weapons from the starter zones, or anything else you can come up with in game that just screams – Runeblade! 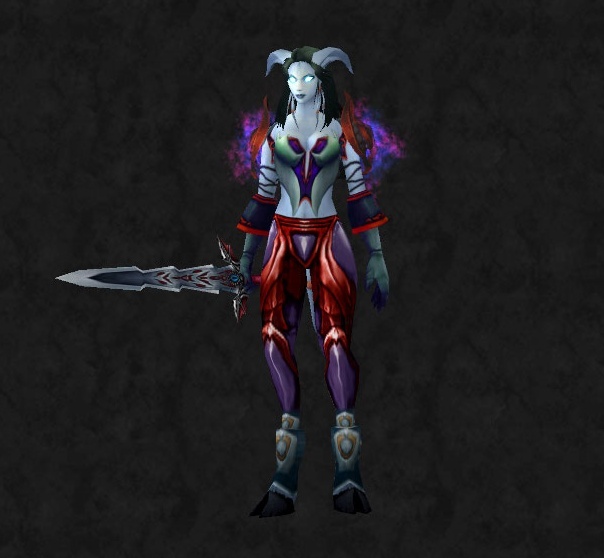 Also, I am not fond of covering up my Draenei tails – so an outfit sans cloak is preferable. Effræti is most unlike her Shaman other half. She bold and fearless, and unlike Effy, does not mind showing some skin as she has little concern for modesty or her own well-being. A former Shaman turned Death Knight, Effræti is brutally to the point and slow to trust, but a fierce companion. This turned out to be a lot harder than I thought it would be. I don’t have a high level plate wearer that I play regularly so I was driving blind. To make matters worse, I have all 50 character slots full so I had to go with a Deathknight I happened to have sitting half way through the starter zone. In the end I came up with three different outfits, one for each of the items Effy mentioned in her request. With each outfit, I tried to make the named item the focal point, picking colours and materials which emphasised it. I wanted to use both the two shades of blue and the bronze from the hilt as my main palette here. This definitely proved the biggest headache. I didn’t want to use the Imbued Plate set but finding a match that I was happy with from the random pieces was hard. 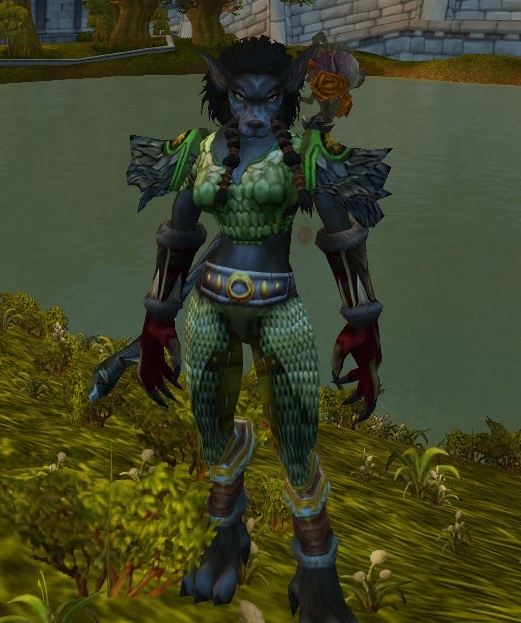 Now that’s the hard bit over with, I’d like to challenge Chatmay of WoW Débutante to come up with something for my Hunter, Twiceshy. She likes to tailor her outfits to her pets and since she’s about to head off on a mission to tame Chromaggus, she would love a suitable ensemble to wear out on the town with him. When it comes to weapons, she’s most definitely a bow girl, crossbows if needs must but never ever guns. She is also quite partial to kilts but will also happily wear trousers or shorts. Oh my, she certainly looks like a Death Knight who could raise the dead in her The Greatsword of the Ebon Blade outfit! I like the second set Erinys, but they are all round very nice and I think Effy would be pleased! I love the Greastsword set. 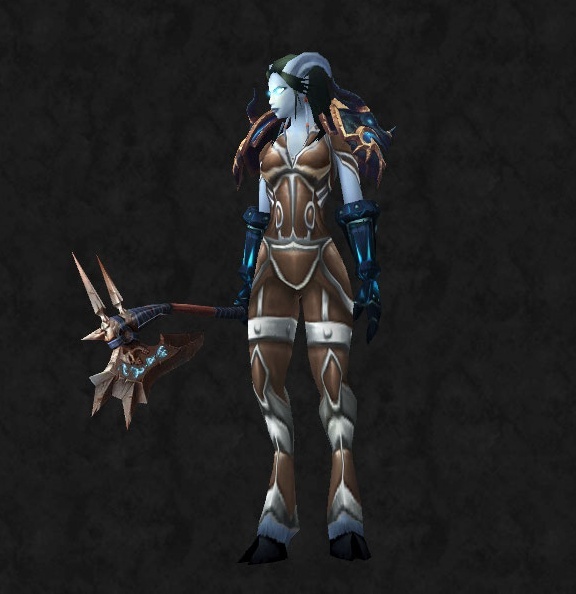 My DK is also a draenei and would look killer in that! I will work on this tomorrow, going to bed for now. Bronzebeard EU, sorry been a bit distracted the last couple of days. Been busy all weekend, I will try to do it tomorrow (frustrated). @Navimie I wasn’t sure when I started it, but the second set has definitely grown on me since then. @Battlechicken I know, it’s almost enough to make me want to level her out of the Dk start zone. @Kamalia Ty. I was determined to use that chest piece but finding to stuff match.. grr.